I am one of the fortunate ones who gets to observe the genesis of the student housing industry in Canada. I continue to meet new contacts all of which have the same conviction regarding Canadian student housing’s potential. I particularly enjoy meeting those who have experiences with or are educated about the U.S. student housing market and its players. I recently spoke with a developer about his newly constructed, purpose-built student asset in Ottawa. – Beautiful asset by the way, 100% occupied with a waiting list in its first year of existence, which supports the hypothesis that Canadian students desire similar housing options that are available in the States and Europe. As with most “getting to know you” conversations, both of us discussed our back grounds in the student business. Inevitably these conversations include “Do you know X? / Do you know Y?” It struck me that a common response of mine is always: “Yes I know him. We use to work together”. 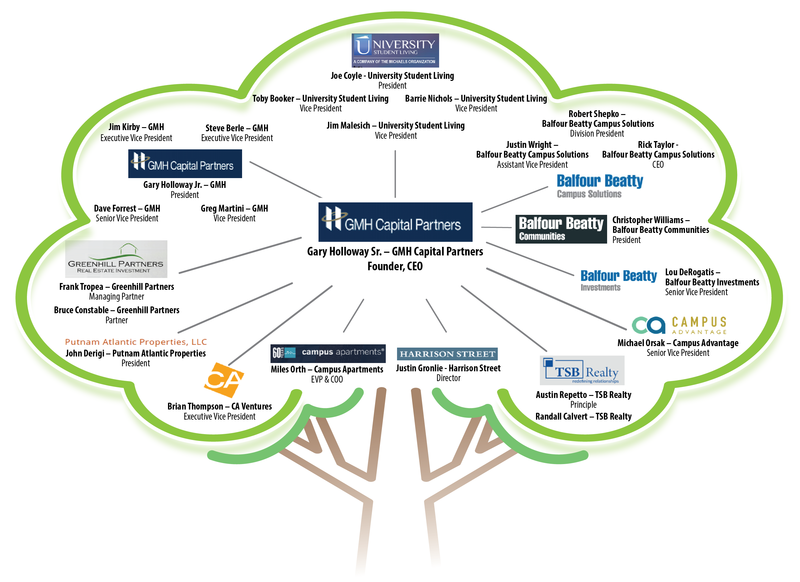 As with with many of today’s student housing professionals, I am an alumni of GMH Capital Partners. I spent most of the 2000’s at 10 Campus Boulevard, Newtown Square, Pennsylvania, the corporate headquarters of GMH. During that time, GMH Communities Trust was the largest owner of student housing in the nation with more than 60,000 beds. In early 2008, the GMH portfolio was sold to ACC for $1.4 billion dollars. TSB Realty (Paoli, PA) is a full service, national investment sales firm specializing in the valuation and disposition of student housing communities. Founded by TSB Capital Advisors’ Timothy Bradley and GMH alumni Austin Repetto in 2014, TSB has closed over $2 billion in student housing sales totaling more than 22,000 beds since its inception. TSB currently has 10 properties on the market totaling more than 4,000 beds. *Source: Student Housing Business’ “The Goldbook of Student Housing 2018”. A few alumni ventured even further and are now located in the above mentioned student housing meccas of Chicago and Austin, holding senior positions at some of the nation’s most well know student housing firms. When I think of the GMH alumni network I am reminded of the “coaching tree” concept in the NFL. The most well know coaching tree is that of Bill Walsh who’s disciples went on to be great or even legendary coaches in their own right. Gary Holloway is considered a student housing pioneer so it is no surprise that those who worked for him in the early days have gone on to become today’s decision makers who are tasked with overseeing the evolution and growth of the U.S. student housing industry. I am proud of the accomplishments of my former colleagues and happy that I still call them friends. Click link below to see the GMH coaching tree. With unimproved land availability in Toronto virtually non-existent, developers have turned to purchasing improved sites, up-zoning the land, and redeveloping it. Some groups choose to create additional land value via the zoning process and then sell at a healthy premium to a third-party who will build the end product. With the recent phasing out of the Ontario Municipal Board (OMB), market participants are quoting a 40%-50% premium for zoned vs un-zoned land. As an urban land specialist servicing clients in this challenging environment, you must have a deep knowledge of the market, understand your clients’ needs, and have that added ability to think outside of the box. Liam Sauro, Associate Vice President in our Capital Markets Toronto Central group, displayed all of these attributes in finalizing a recent deal – and it started with a hunch. Liam was aware that the Wynn Group of Companies was in conversation with Timbercreek Asset Management to sell a portfolio of approximately 4,500 residential units and three million square feet (sf) of commercial space — a transaction estimated at over $1 billion. In assessing the portfolio, Liam had a hunch that one of its assets was not being fully valued at market for development lands. The downtown site in question was 484 Spadina, home to the former Waverly Hotel. Zoning was in-place for a rental apartment totaling 15-storeys and 125,423 square feet to accommodate 309 (279 sf) bachelor units and 5,042 sf of first-floor retail space. On behalf of a client, Adrian Rocca of Fitzrovia Capital, which specializes in high-end residential development (https://www.gta-homes.com/condo-developers/fitzrovia-capital/ ), Liam approached the Wynn family with the theory that the site may be undervalued as part of a larger portfolio. He believed value could be enhanced by broadening the building’s design from small bachelor units catering exclusively to university students to incorporating two- and three-bedroom units that would serve both students and young working professionals. Together, Liam and Fitzrovia drafted a letter of intent and presented it to the Wynn Group. In the end, Fitzrovia and its partner AIMCO closed on 484 Spadina in March 2018 for $23.6 million dollars, which equates to $188.20 per buildable square foot. Fitzrovia is currently in the process of altering the building’s design in support of Liam’s idea. Shawn P. Lubic, is Senior Financial Analyst, Capital Markets, Cushman & Wakefield. Canadians are Just Like Americans – Wrong! In addition to Canadians spelling color, favorite, neighborhood, and center incorrectly, I’ve learned that there are lots of cultural differences between Canadians and Americans. In my two years living above the 49 parallel, I’ve observed the “niceness” we hear about is real, social justice is top of mind, and giving back to the community is big for individuals and corporations. Once you think you’ve figured things out, you then realize you only know about oneprovince; in my case, Ontario. Next to Russia, Canada is the second largest country by land mass, and its ten provinces and three territories are all unique in their own way. Quebec is even recognized as a distinct society in the constitution, and has its own French language and civil laws. Then there’s the Western and Atlantic provinces, which are whole other stories. Of course, closeness to campus is the most desired trait of a Canadian student housing asset, and students appreciate purpose-built amenities such as fitness centres, social /study rooms, and so on, but American staples like one-to-one bed-bath ratios and in-suite washers and dryers are not expected. Neither is a “party atmosphere”, which is a common feature of off-campus, purpose-built housing. “Canada doesn’t need jiggly leasing agents,” said one source. While this sounds crass, I got what he meant. How many student residences have I toured that had beautiful staff at the front desk? Each complex is a pool party or BBQ waiting to happen. Websites are populated with gorgeous young people having the time of their lives. In Canada, the “party scene” as a selling feature is pretty much non-existent. Housing is more utilitarian in nature. Like many U.S. university students, I did my time in on-campus housing for one year and then high-tailed it off campus for the remaining three years (four actually – sorry Mom and Dad). Canadians, on the other hand, see living on campus as a big part of the post-secondary education experience. Universities, as a result, are continually looking to add beds on campus for both first- and subsequent-year students. Canadian universities have a high foreign-student ratio. According to a CBS News study, the number of foreign students at the University of Toronto increased from 10% of enrollment in 2007 to 20% in 2017. Foreign enrollment at the University of Ottawa has tripled in the past 10 years and represents about 23% of total enrollment at the University of British Columbia. Contributors to this blog series consistently commented that 50% of the students living in their facilities were either foreign or first-generation immigrants. Another person noted that 50% of the students living in his purpose-built housing were foreign. Unlike new immigrant students, foreign students must pay a hefty premium for being educated here and tend to be well financed. In fact, as my source said, these students desired a higher living standard that his complex provided. This, he saw, as an opportunity. Nothing exemplifies the perils of not understanding a culture more than Campus Crest’s entry into Canada. McGill University students in Montreal are a prime example of a community after the “experience” and demand for on-campus and university-controlled housing is immense. Between 2003 and 2010, McGill purchased three hotel properties within blocks of the campus and converted each to student housing. These projects were highly successful. In an attempt to replicate this success, Campus Crest purchased the Delta and Holiday Inn Midtown between mid-2013 and early 2014, and converted them into the Evo Centre-Ville and Evo Vieux-Montreal. Both properties were well located close to campus and renovated to a high quality. According to an article in RENX, at the beginning of the 2014-2015 school year, Campus Crest achieved a total occupancy level of 10.9%. In order to drive occupancy, management held “the world’s largest Toga party” in the winter, threw an “EvoHouse party” in April, and hosted a McGill varsity sports awards gala. As of May 2015, preleasing for the 2015-2016 school year was 14.6%. Campus Crest sold their interest in the Evo assets in the fall of 2015 (prior to their portfolio sale to Harrison Street). Understanding the culture is key to owning and managing successful student housing properties in Canada. While high living standards are universal, cost-conscious first-generation Canadians, foreign students, and generally more conservative Canadians are not the ideal target audience for extras like planned parties. Students, being students, find other places to have fun. The upcoming third part of my blog series will delve into the “numbers”. What are the ramifications of cross-border investing? Is there enough demand to warrant U.S. companies coming to Canada? Is it worth the headache? I would like to thank the following contributors to this blog: Jason Taylor, EdR Collegiate Housing; Mike Porritt, Scion Group; Patrick Miksa, Knightstone Capital Management; Henry Morton, Campus Suites; and Craig Smith, CHC Student Housing.